Your browser does not support inline frames or is currently configured not to display inline frames. "This is a very sad day. Another gift to us from above has come and gone. Platini will remain in our memories as one of Juventus' greatest ever players." "He didn't run a lot like Cruyff and didn't depend on his physique, but I liked how he was the brain organising things on the pitch. He was a player who used his head in the broader sense. The way he shone with France and Juventus, and his capacity for taking fr ee-kicks, made him the European footballer of the 1980s." "Michel has never chosen to do things the easy way. He achieved everything in his career as a footballer and now he has unseated the man who controlled European football for many years. Okay, [managing to do that] wasn't football exactly, but it makes me realise how much he has achieved even more. I feel pride, of course, as does his mother. We're proud to have put a boy like him into the world, because he nonetheless gave us all sorts of headaches from a young age." "He was exceptional because he never once looked up. When a player is as successful as he was, there's always the risk they'll end up doing something stupid, like Maradona. He, on the other hand, was always calm, quiet and friendly." "Michel was one of those great players who saw fitness work as being a bit superficial. He used to say, 'We're not going to compete in the 5,000 metres at the Olympics, we have to play with our feet." 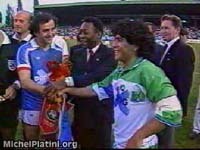 "When I was a kid and played with my friends, I always chose to be Platini. I let my friends share the names of my other idols between themselves." "He was a great player who left a mark on his era, and it's always good when players take up positions in the higher echelons of the game. He knows everything there is to know about football." "I was born in football. My father was a very good football player, and as an Italian immigrant was always passionate about the game. Football is a fantastic and intelligent game which teaches us how to live together, how to share when you are better than others. Football is an extraordinary education for life." "If a FIFA World Cup tournament had been held every year between 1982 and 1986, France would have won two or three." "The boring thing is that you always have to justify yourself. I spent more time explaining why I made such and such a choice than making the choice." "The street is the best way to become a good footballer." "What Zidane does with a ball, Maradona could do with an orange." In the words of Bobby Charlton, "What a playmaker. He could thread the ball through the eye of a needle as well as finish."